Watch “Coco” Friday, October 26th, at the Main Library! Halloween ‘Spooktacular’ Movie on the Plaza! 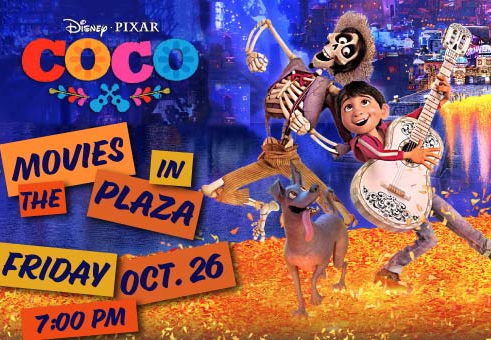 Ghouls, ghosts and goblins of all ages can come to the Main Library at Goodwood at 7 p.m. Friday, October 26, to watch Coco on the BIG screen in the Outdoor Plaza! This 2017 animated fantasy film is about young Miguel who is an aspiring musician, but his family has had a ban on music for generations. On his journey to follow his dreams, he enters the Land of the Dead to find his great-greatgrandfather, who is a legendary singer. Feel free to dress in your favorite Halloween costume, and bring your lawn chair or blanket to sit comfortably while you watch. The film also will be simulcast in the Large Meeting Room for those who prefer this option. Local vendors and food trucks will be on site for the purchase of refreshments. Please note that the Library closes for business at 6 p.m. that day. Be there, if you dare!